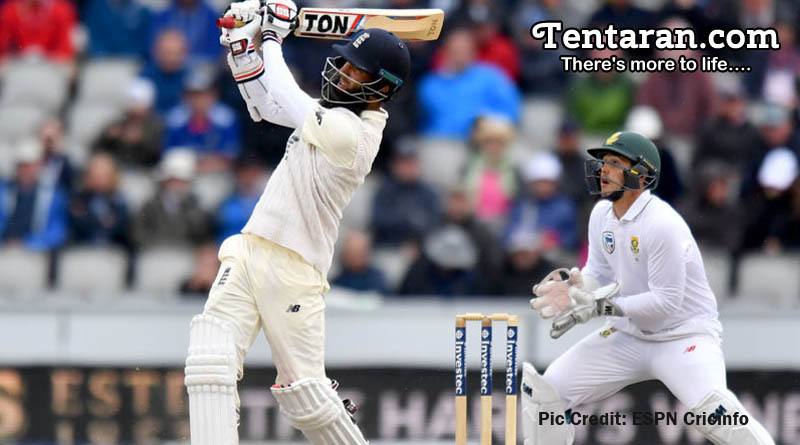 England extended their lead over South Africa by 360 runs on a rain-shortened Day 3 of the fourth test match at Old Trafford. Wobbling at 153-7, the English innings was saved by fearless innings of 67 by Moeen Ali which helped them end the day at 224-8. They will start Day 4 with 2 wickets left and a commanding lead against the hosts and will be looking to seal the series already 2-1 up. Having dismissed South Africa for 226 in the first innings after scoring 362 themselves, there was a danger that England, despite a first-innings advantage of 136 runs, might squander the dominance they had earned over the first two days. England was 289 ahead when their seventh wicket fell and in danger of letting South Africa back in. Moeen coming in at No.8 counter-attacked brilliantly, dishing out some particularly brutal treatment to Keshav Maharaj. Moeen was unbeaten on 67 from 59 balls when play was finally called off after a gray Manchester sky finally gave way to rain. “We’ve put pressure on them and the match has turned our way,” said Moeen. “I went on instinct and when I’m playing like that, I don’t care who is out there on the boundary, I just back myself. No team has previously made 300 to win in the fourth innings of a Test here and England will go into Day 4 of the match quietly confident of registering an unchangeable total for the Proteas under tough conditions. England, 2-1 up, are going after their first home series win against South Africa since 1998.